I was recently sent a few samples of AGWA Coca Herbal Liqueur along with a handful of cocktail recipes to try. AGWA is a 60 proof (30% alcohol) liqueur made with Bolivian coca leaves. It is produced in Amsterdam using a blend of 36 herbs and botanicals. Those herbal ingredients give off a green glow when AGWA is frozen; unfortunately you will not get to see the full extent of that glow here today as I didn't have time to completely freeze my sample. Next time, I promise! I decided to make the Bolivian Mojito first since I had most of the ingredients on hand (and since the Mojito is a staple here in Miami). 1.5 oz Frozen AGWA, 12 mint leaves, 2-3 lime wedges, 2 tsp. sugar, 7 oz. club soda, splash of rum. Gently crush the mint leaves in a long glass. Squeeze the limes over the crushed mint, and add the sugar and crushed ice. (I measured out that approximately 5 Splenda packs is a 2 tsp. equivalent). Add the AGWA, your favorite rum (I used a white Brugal), and club soda. Stir well. Garnish with a fresh lime wedge and fresh mint leaves. I knew I should have read the instructions before starting and I'm kicking myself for not freezing the AGWA first. However, the green was still pretty cool. First impression is a tangy, herbal flavor. The citrus sourness from the lime has a nice play with the sugar. The mint really pops in this drink as well. 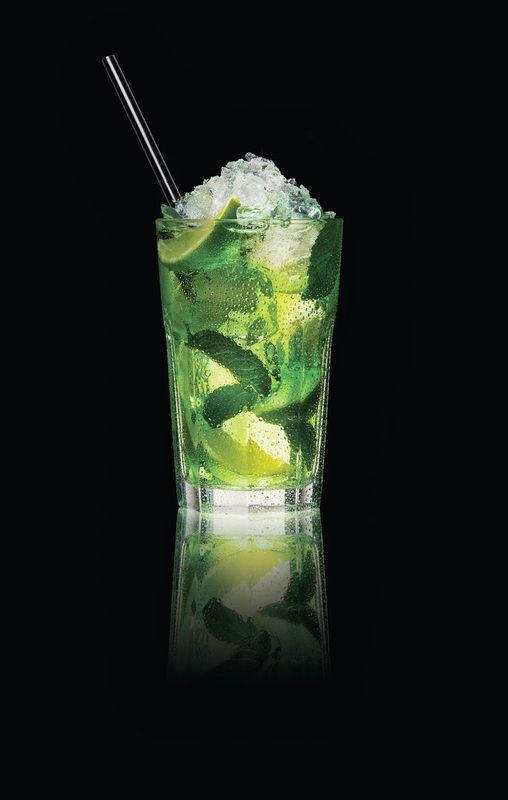 Overall, a very refreshing drink and an awesome twist on the traditional Mojito. Compare the professional photo below with mine. Mine is good (I think) but they definitely used the frozen green glowing AGWA, and that is very cool!